These Knipex 8751250 extra slim Cobra water pump pliers have automatic adjustment and they can be opened and adjusted directly at the workpiece with one hand. The handles incorporate a multi-purpose press button for fine fitting directly onto the workpiece. The extra long narrow jaws provide good access. The integrated spring of the automatic adjustment is shielded in the handles for user safety and the gripping surfaces have special hardened teeth which are hardened to approx. 61 HRC. 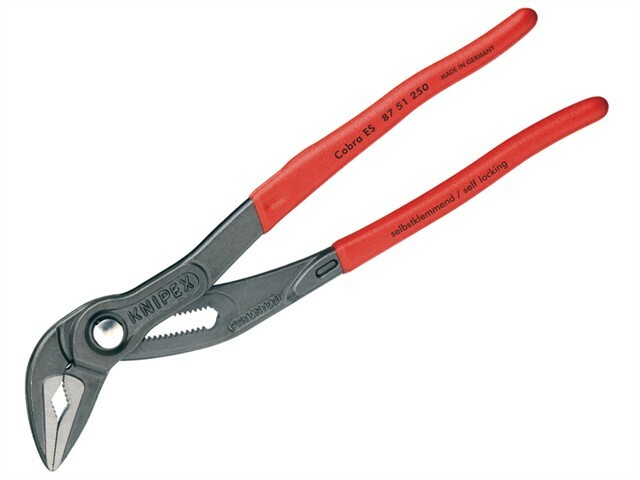 These Knipex 8751250 pliers are low wearing but have a secure gripping action. The combination of a fine adjustment, which ensures optimum adjustment to differently sized workpieces, a user-friendly handle position and a secure catching of the hinge bolt ensures against unintentional shifting when in use. The box-joint design offers high stability and the double guide will hold securely on nuts or bolts. A secure grip is provided with the minimum of hand force. These Knipex water pump pliers have a user friendly guard to prevent the operator's fingers being pinched. The pliers are made from strong chrome vanadium electric steel that has been forged and then oil-hardened for added strength and durability. They have PVC dipped handles for user comfort and a positive grip. Length: 250 mm - 10-inch.